Get some WD-40 on that Lancer Chainsaw and brush up on your cement-mixer voice, because Gears of War 4 is nearly upon us. The most eagerly anticipated game coming exclusively to the Windows Store since the dawn of UWP marks a return for the iconic Xbox 360 series to PC, which it’s been absent from since the original Gears of War in 2007 (barring the Ultimate Edition). 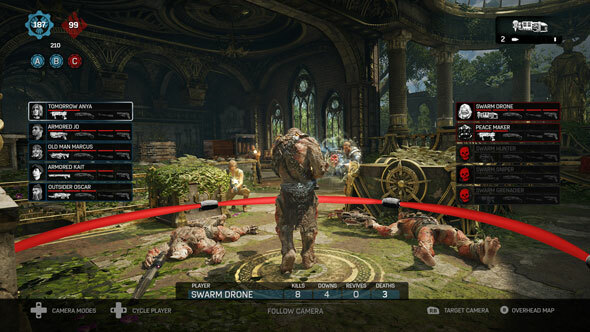 Good news for couchplay fans: Gears of War 4 is getting campaign split-screen co-op on PC. 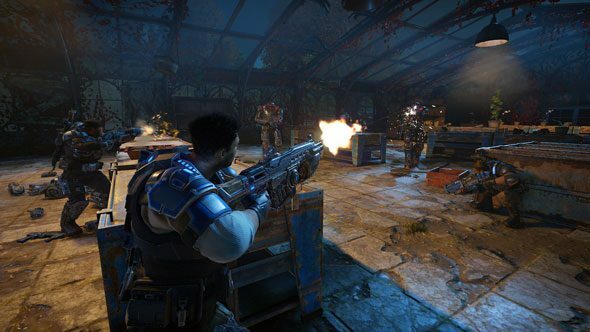 I spoke with the game’s creative director, Chuck Osieja, about Gears’ PC return, the new character models, and why the PC is set to be the perfect platform for Gears of War 4. 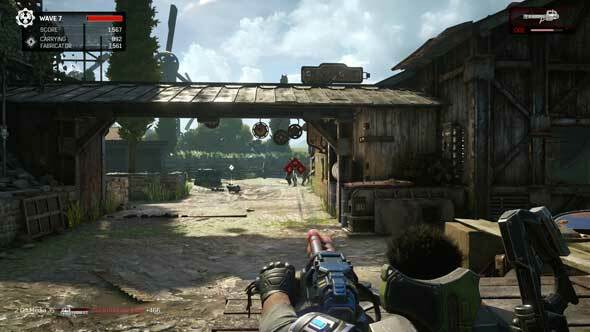 PCGN: Gears of War revolutionised the third-person shooter genre back in 2007. With Gears of War 4, are you looking to make similar upheavals, or simply trying to enhance the now-established formula? CO: It’s definitely revolutionary in some places, like Horde, which we’ve reinvented to allow fortifications anywhere you want, build whatever you want and also have the classes with the skill-based trees that give you buffs based on how you play. In terms of the core gameplay, we really wanted it to be evolutionary because we’re a brand new studio and I think we need to earn the trust of the Gears fans, who are incredibly passionate. We’ve no credibility with the fans outside of Rod [Fergusson, studio head at The Coalition], who was one of the original creators of the Gears of War franchise. It’s really important for us to be able to prove to the fans that we understand and care about Gears in the same way they do. So we wanted to build a game that felt like Gears first, then evolve on top of that. I think a radical revolution would have been the wrong move, because it would have been giving the middle finger to the fans, saying ‘We know better than you do,’ and I don’t think that’s really being as respectful to the franchise as we should be. It’s an amazing franchise, it’s one of the most iconic franchises in all of video games and it’s up to us to prove to everybody that we deserve that mantle and are able to take it forward. The character models are noticeably slimmer than they were before. They used to be big, chunky ogre-like figures, whereas now the heroes are younger, fitter and – well, sexier. People were pretty endeared to those chunky old designs. What inspired this design shift? We wanted to stylise them a bit, modernise them a bit. The original designs were a kind of a reflection of Chris Perna, the original art director at Epic who’s still there – he’s a stocky, muscular guy, and the old Gears take after him. I think it was great for that time, but part of the evolution of the series was to modernise. The interesting thing is that just by removing some pieces of the armour and making the characters look a bit more svelte, it changed the way the game feels without changing the interaction of the characters inside the world. They do look slimmer, but we actually went back and bulked them up in certain areas because we needed them to still feel like big powerful characters. It was a combination of trying to smooth some of the rough edges and not feeling that the original models were in step with how the artistic style of video games looks today. As a PC gamer, a big question from me and I’m sure many other PC gamers is: will there be split-screen co-op for PC? Yes. The way it will work is that the main person playing as player one will sign into their Xbox account, while the second player will use a guest account. Great news! That bucks a bad trend among triple-A PC developers ignoring split-screen. When Rod [Fergusson] came to the studio, he talked about co-op being the cake and not the icing. So when we build a Gears game we think about co-op in every aspect, whether it’s the weapons, environments, enemies, PC, console – everything needs to be built around the co-op experience. When you play split-screen as the second character, whether you’re playing as Del or Kait, their story has to be as meaningful as the first player’s because we never want you to sit there thinking ‘well I’m just an avatar that’s helping the other player’. We want that experience to feel meaningful to you. So they have their own storylines, own dialogue, their own things that happen during the course of the game, unique to each character. So co-op is the quintessential way to play the campaign, in your eyes. From the ground up, Gears is built to be a co-op experience. 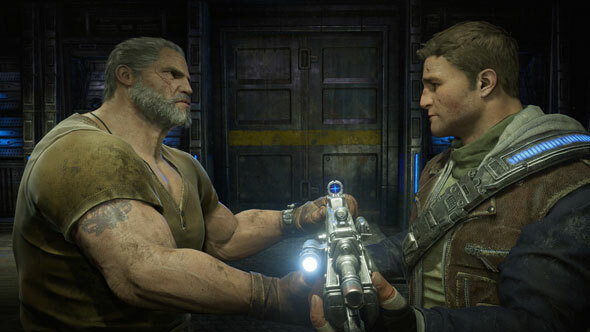 Whereas a lot of games are getting rid of split screen co-op because of all the decisions they’re making about what they want the experience to be, Gears will always be a split screen co-op experience because you and I, sitting on the couch, are able to have that special camaraderie and discussion created by being in the same room. You can play split-screen versus bots but not against another player. And we don’t allow PC users to just go into competitive matchmaking against an Xbox One user because PC players have a mouse and keyboard. But we announced that you can host a private match and have PC players in player-vs-player matches with XBO players. Gears of War – and the third-person shooter genre as a whole, for that matter – on PC has never really been much of a thing. The original Gears of War came out on PC but due to poor sales, GoW 2, 3 and Judgement never did. Why do you think such an acclaimed series or genre hasn’t received as much love on PC as on consoles? I think part of it is that PC gaming and console gaming diverged for such a long time. There were PC games, and console games, and never the two shall meet. I think what’s been so exciting about what we announced last year is that we don’t want that to be the case anymore. Gamers should be able to play anywhere they want and [on] whatever platform best suits them. PC isn’t a second class citizen. They are gamers like anyone else and we’re going to build games that scale across those different platforms to give you the experience that you want. What’s changed in the intervening years on the PC scene for you guys to decide to bring Gears back to the platform? It’s not only changed on the scene, it’s changed for Microsoft as an organization. We want PC to be a meaningful console for people to play on, that’s why we do the Xbox Play Anywhere program. If you buy digitally on Xbox One, you get the PC version as well, with the idea being that you grow as a gamer whether it’s on console on PC. So for us, when we author this game, we author it for the highest resolution possible, even though that doesn’t work on the Xbox One, because we know that if you have a great machine at home that’s a PC. We support unlimited frame-rates, dynamic resolution, G-Sync, HDR, all that stuff. Unlike other games that I worked on in the past where we’ll build the console version first and have some people port it over to a PC later on, here we’ve had a whole team of guys dedicated to building the PC version from the ground up to make sure it’s the best experience possible – from the visual customisations right down to the mouse-and-keyboard controls. Gears of War always felt quite slow-paced and weighty. When bringing it to PC – with a keyboard and mouse that’s suited to a fast-paced, twitchy style of gameplay – did you have to take into account the inherent differences betweens this traditionally console series and the type of gameplay PC players are used to? We didn’t need to make huge changes on that front. We don’t want to make the PC game a different experience, we want to make it a better experience. We’re not going to break the game just to give keyboard-and-mouse users a quicker experience, we want to make sure it works inside of what the Gears experience is supposed to be. So it’s going to be smoother, it’s going to be better, it has all that stuff but it’s not going to be broken in order to make it a special experience for PC. There’s a crap tonne of PC gamers working in the studio. Ryan [Cleven, lead multiplayer designer] is a heavy PC gamer himself so a lot of thought went into the decision-making. We’ve got the right people onboard to factor in both sides. So yeah, definitely keyboard and mouse turns way faster, but it’s not our intention [to] go over to a PC person who’s very much used to that and going, ‘Hey, we’re going to limit you, because that’s just not how it’s supposed to be here’. It’s as much a PC game as it is a console game.